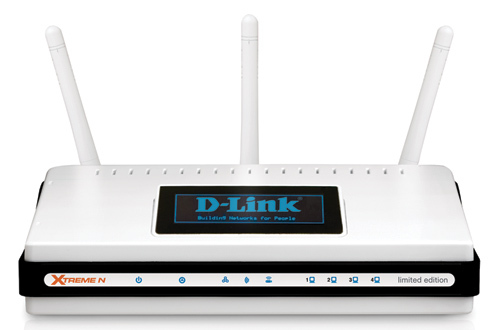 D-Link® is proud to present the new Limited Edition Xtreme N™ Gigabit Router (DIR-660). Introducing new cutting edge technology, D-Link raises the bar once again by incorporating the industry’s first OLED display on the router that monitors your network activity. Created around the idea of “You can never have too much information,” the Network Activity Display provides time-saving benefits for network specialists and the casual network administrator alike. With a luminous and vivid display, pertinent information will be relayed to you on-demand. Whether you want to monitor your network’s health or are unsure of network settings, you can quickly check all of your router security types, network connectivity, wireless network names, and other settings. Since security is a large concern for networks, the DIR-660 provides the strongest level of wireless protection available to you today: WPA2™. The defense doesn’t stop there. The Internet can be a cesspool of viruses ready to invade your home and hackers looking to steal your identity. To help combat these potential threats, the DIR-660 provides you with Dual Active Firewalls and a host of harm negating features to keep the information where it belongs. Create a wireless network to share high-speed Internet access with computers, game consoles, or media players from greater distances in your home or office. * Intelligent Wireless Prioritization Technology. * Xtreme N technology allows for farther home coverage*. * Network Activity Display for on-demand network information.Secure your wireless network using advanced WEP™, WPA™, or WPA2™ encryption. * Easy to get started with D-Link’s new Quick Router Setup Wizard. * Supports Good Neighbor Policy – will not interfere with other wireless networks. * Backward compatible with 802.11g and 802.11b devices including game consoles and digital media players. security is a large concern for networks, the DIR-660 provides the strongest level of wireless protection available to you today: WPA2™. The defense doesn’t stop there. The Internet can be a cesspool of viruses ready to invade your home and hackers looking to steal your identity.